For the first time in history, robotic technology meets frozen yogurt franchising! High-tech, robotic vending will quickly outpace less efficient trends in the frozen yogurt industry, making it even easier to access this unique market. With exclusive new patents, Reis & Irvy’s is at the forefront of this revolution, reinventing the business of frozen yogurt. 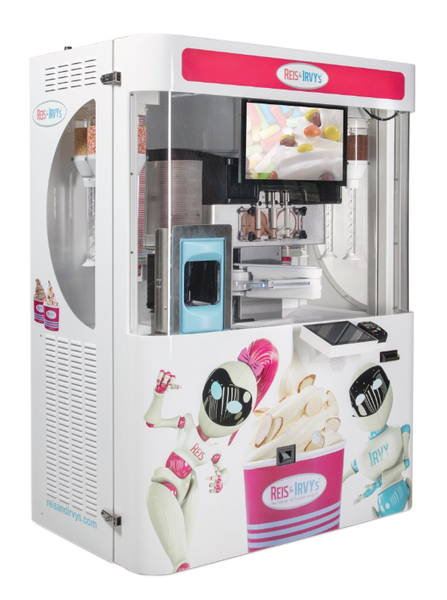 Reis & Irvy’s (OTC:VEND) revolutionary frozen yogurt robots, are serving up a great opportunity for prospective franchise owners. Only slightly larger than the average vending machine, and fully self functioning, Reis & Irvy’s has proven to be on the forefront of innovation and customer service. Serving up 7 different flavours of frozen yogurt, with a choice of 6 different toppings, they provide an engaging customer experience and are a hit with all ages. They are sure to enhance any location they are placed, making them a secure investment for franchise owners! Check out the video of the Reis & Irvy’s robot in action on the right side of this page! These incredible frozen yogurt robots can be placed practically anywhere, turning any location into an instant sensation. Our Corporate Locations Team works diligently to secure locations across the country that provide not only the best environment for the Reis & Irvy’s brand product, but for visibility and sales opportunity. The robot is fully self functioning and you can access it from an app on your phone. All costs are based on a % of revenue, which acts as a safeguard against loss. If your robot is underperforming... we just move it! 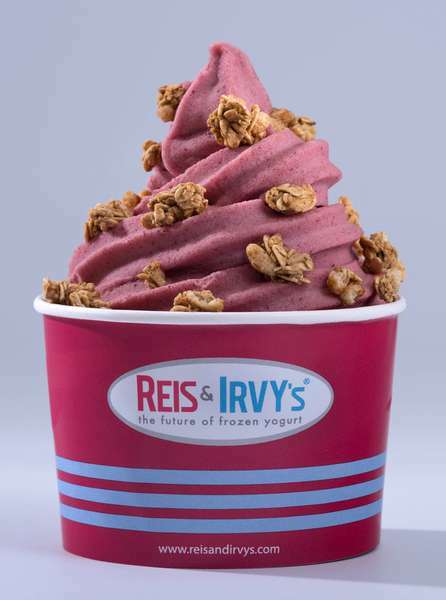 At the heart of Reis & Irvy’s is an innovation in both frozen yogurt, as well as advanced vending technology. 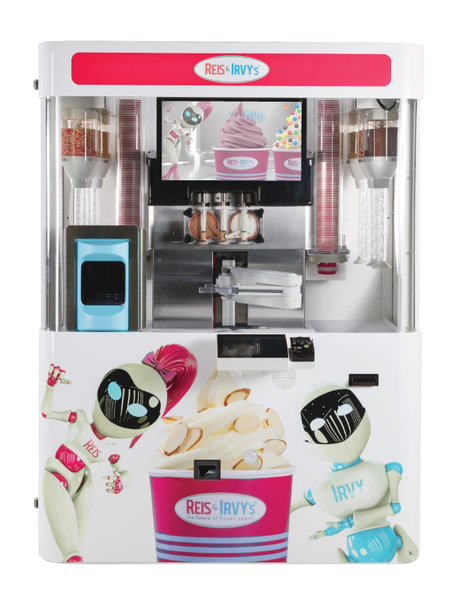 Never seen in the marketplace, the Reis & Irvy’s Froyo Robot is a self-contained robotic marvel, serving 7 different flavors of deliciously creamy frozen yogurt, and up to 6 choices of delicious add on toppings. From it’s interactive touch screen ordering system to the creation of a 12 oz. serving of deliciousness, each robot offers customers an advanced point of sale experience, enhanced and presented through a multi-sensory journey of fun and entertainment. All served up in just under 60 seconds! Reis & Irvy’s franchisees are fully supported by a national installation team and delivery team, offering full service, white-glove installation for all locations across the country! No matter where your Froyo Robots are placed, the Reis & Irvy’s logistics and support team will ensure that each one of your robots is managed professionally and efficiently...from installation to instant sensation! Upon completion of your delivery and installation, you can rest assured that you will be versed in every aspect of your Reis & Irvy’s Froyo Robot and will be ready to begin your journey into providing customers at each of your locations with a frozen yogurt experience that will leave them coming back for more! The Reis & Irvy’s robots are designed to recognize when a potential customer approaches or walks by. When triggered the robot enters an attract mode, which is designed for maximum entertainment! Complete with a 35” video screen that plays an animated Reis & Irvy’s cartoon or customizable content. Become a franchisee today! For a direct line to one of our sales reps visit www.robotfranchisecanada.com and use promo code 4R7.